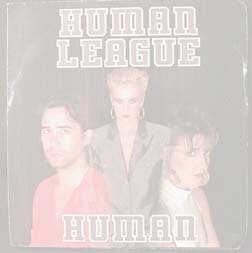 Dissatisfied after working for nine months with British producer Colin Thurston, Human League switched to Jimmy Jam and Terry Lewis who penned "Human" -- a song that gave Human League their second chart-topper, four years after the first #1, "Don't You Want Me." The lyric was Terry's concept. Songs always have people asking for forgiveness, and he thought, "Wouldn't it be cool to turn it around in the middle?" The producers/writers got in a big argument with the band, because they used a girl named Lisa Keith for background vocals, and the women in Human League didn't like it, they wanted to do it, but it would have sounded wrong. Jimmy Jam says "It's the one song of our career that we said, If we don't release the way we mixed it, we're throwing it out the window." Released August 11, 1986, Human topped the UK Chart at position 8 and topped the U.S Charts at Number 1 in November 1986. This song can be heard in the made for television movie "Nick Knight" which Rick starred in. Human is on Rick's "The Day After Yesterday"